Looking back now, that race on December 9 seems like an amazing triumph. I don’t know how I did it. Right now, I can’t even walk a straight line across the room. I made it 9 whole days on the Vancomycin before the poison affected me noticeably. Then, what a spectacular crash! So, I was switched to Clindamycin, the second choice drug for my antibiotic-resistant staph infection. I was nervous about switching (with good reason, it turns out). As they say, “better the devil you know”. I made it only 32 hours on the Clindmycin before my body hollered “stop” with a rash. The doc put me on an official drug holiday until December 26, the day after Christmas. No more medicine balls. No more waking up just to hook up an IV line. I just have to take Benadryl every 4 hours, until I am no longer red and puffy. I’ve never had a drug holiday before…..what should I do? Am I supposed to decorate? Go out to eat? Surely there must be a proper way to commemorate the occasion. I’m afraid my brother and his family won’t be here until after the drug holiday is over. That’s okay, our family has never worried much about celebrating holidays on the proper dates anyway. Racing without sweating: Is it possible? Some people run races to win. Some people run races to set a PR (personal record) for the distance. Some people run races to socialize. Sunday, in the RunGirl 13.1 Women’s Half-Marathon Relay, I had a new racing goal, one I’d never had before: My goal was to avoid minimize sweating. You see, last week I began a 4-6 week course of intravenous antibiotics every 12 hours, to rid myself of an MRSA staph infection that had somehow taken residence in my head. It was discovered through a culture taken during my sinus surgery two days before Thanksgiving. I was actually rather glad of the news….after two sinus surgeries in one year, it’s nice to have an answer, and hope of getting the problem fixed. My sinus surgeon is wonderful, but I don’t want to spend all my holidays with him! So why did I decide to run a race with a PICC (peripherally inserted central catheter) line in my arm? Well, in part, because it seemed so very Dave-like. My brother Dave Mows Grass has a habit of entering ridiculously long races for which he is woefully unprepared. He runs about once a week, but still finds a way to complete marathons and ultramarathons at a reasonable pace. Even more remarkable, he enjoys them. He was recently forced to miss a 50K (yes, that’s about 31 miles) for non-injury related reasons. (well, he missed due to injury, but not injury to himself—he missed the race because Mrs. DMG hurt her back.) So, as a salve for his disappointment, he signed up for a 100K race. One doc told me absolutely no running with the IV line, but I could ride my horse with it. The other doc, at the hospital where the PICC line was installed, said light running could be possible, and walking would be great, as long as it wasn’t hot. He explained that the main danger with these lines was infection, and that infection liked to grow in moist environments. So running was fine as long as I could run without sweating much. (He didn’t seem too keen on my riding the horse in a dusty arena.) When faced with such conflicting advice, the sensible thing to do would be to avoid the activity. Of course, I’ve never been sensible (remember, I’m an 9th-year doctoral student). 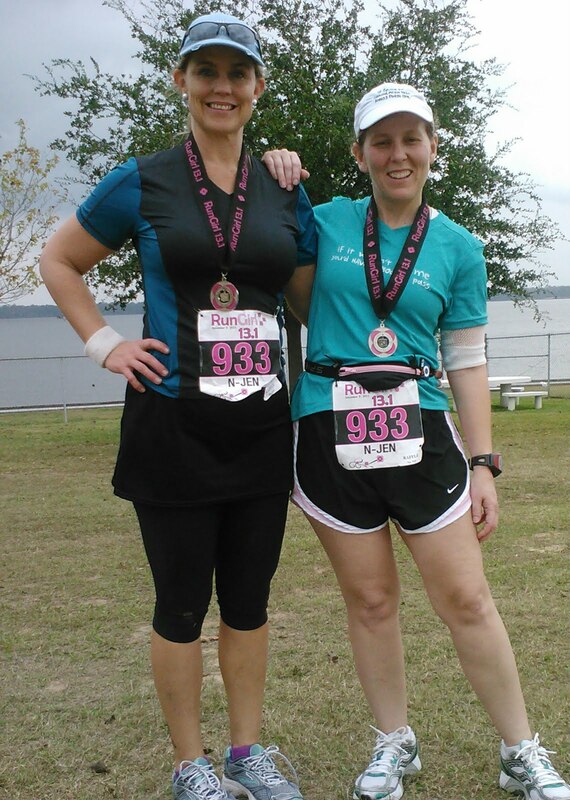 My friend Nancie and I had signed up for this race hoping it would motivate us both to run regularly. It didn’t quite work out that way. I ended up running about once a week most of the semester, and Nancie didn’t do much better. My last two runs were a 7-miler exactly four weeks ago, and a 3-mile Turkey Trot five days later at the college where I work. (My 3-year streak of winning a turkey was broken, because someone else entered the Female Faculty/Staff Runner division. I was very happy for her and glad for the competition.) Nancie had pulled her hamstring turning cartwheels, and could barely tie her shoes on race morning. I was afraid Nancie would never forgive me for talking her into this, but on race day she was really excited and glad we were there. As soon as we arrived at Alexander Deussen Park, she talked a kind man (one of very few men at the park that day) into taking our picture. Actually, she talked him into taking several pictures, with a variety of poses and camera angles. She just got a new job in sales, and I can see why….I’m willing to ask a stranger to take a photo, but I never would dream of critiquing it. As in, “Can you do it again, with a little less sky? Can you kneel down and take the picture from a lower angle? That’s an okay vertical picture—now can you take a horizontal one, so we can see more of the park?” She asked it all with a smile on her face, and was so enthusiastic and appreciative he didn’t seem to mind. This was a real park with real facilities—no need for porta-potties, at least at the start. There was a good-sized line for the ladies’ restroom. Nancie, ever the daring one, thought it was silly to stand in line for the ladies’ room at an all-girls race, when there was a perfectly good (and presumably empty) men’s room right next door. (She hollered from the doorway first, to make sure the coast was clear.) Sure enough, a bunch of people jumped out of the ladies’ room line and followed her. I’m sure they had all been thinking of using the men’s room, but didn’t have the nerve to be first. Leadership requires courage. It was fun to watch the start. Nancie started near the front, with the fast people. I don’t know how long she kept up with them, but I know she started fast enough to avoid getting run over. After watching the whole pack run by, I had plenty of time for a leisurely stroll around the start area and a line-free pit stop. Then a pleasant half-mile walk to the relay handoff. At the relay handoff location, while waiting for Nancie to arrive, I hung out with a lady in a cast (got stuck in the clips of her tri bike and fell over) and another lady with a broken sternum (car accident) who planned to walk her relay leg. They quizzed me about my IV line...we made quite a trio; I wish I’d thought to have our picture taken together. When I started, I genuinely intended to walk quite a bit. Like most of my other good intentions, it didn’t happen. At first I walked most of the sunny stretches, and ran (slowly) in the shade. But it wasn’t long before I decided some sweat was inevitable. Then I started reasoning that if I got done quicker, I wouldn’t sweat for as long. I ended up running nearly all of it, though very slowly. The second leg of a relay is a heck of a lot of fun. Most people were running the full 13.1 miles, so they were on mile 10 when I was on mile 3. Everyone around me looked really worn out, but I was fresh and full of energy. Since my partner wasn’t fast, I ended up in the far back of the pack…most people I saw were walking a lot. I don’t think a single runner passed me after the first couple minutes. Even at my slow, sweat-avoiding jog, I steadily passed person after person. About a mile and a half from the finish, I took a walk break and called Nancie to tell her I’d be done in 15-20 minutes. I never thought I would ever make a phone call during a race…I had seen other people do it, and thought them silly. What on earth could be so important that it can’t wait until after the race? 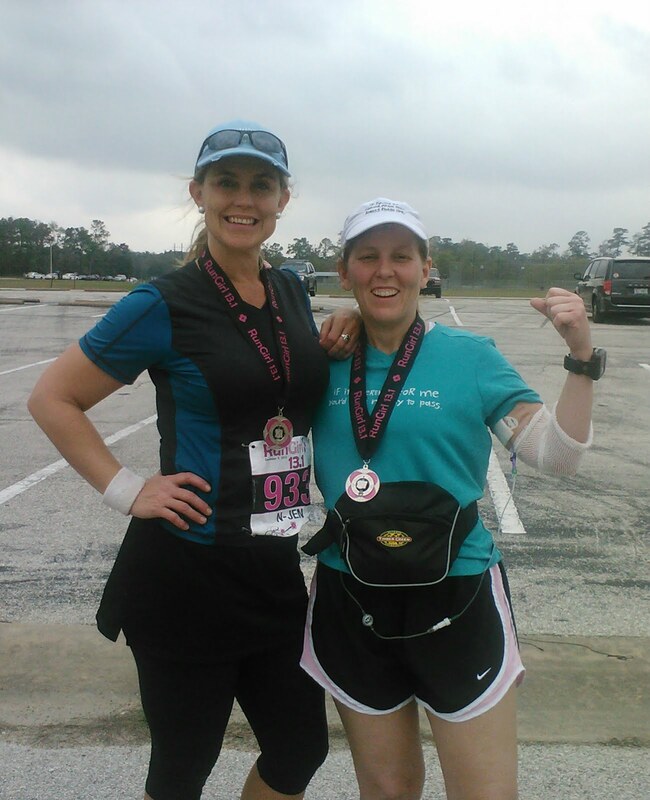 But I knew Nancie wanted to see me finish, and she had no idea how long I would take. So it made sense to call. Still, it’s embarrassing. I must say, there’s something enjoyable about running a race without sweating. Usually when I approach the finish of a race, it seems like it takes forever to get there, because I’m feeling so miserable. Not today! It was easy to maintain my pace the whole time, and I had plenty of energy left for a sprint to the finish line. 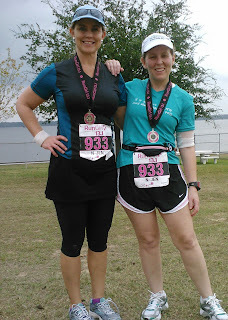 I have decided relays are great fun…Nancie and I had a blast, and we both want to do another one. Now I just need to talk Dave into running the Hogeye relay with me! Nancie insisted on a biceps pic after I hooked up my meds. These pics are from my phone...Nancie's will be better, taken with her new Samsung Note. Samsung needs to pay her a commission,,,,I think she sold 3 phones in the parking lot! Wow, just wow. Here I am, at my first Aggie football game in Kyle Field. I’m trying to get in my 30 minutes of writing before the game starts, because Aggies are not allowed to sit down during home football games. I’d rather not try to write standing up. Plus, I have a feeling it is going to get rather loud in here. 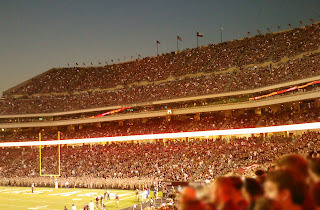 Our seats are perfect: on the 50-yard line, lower deck, right by the Aggie band. Our timing was also perfect—we arrived just as the band marched in. Then, a bonus: Junior ROTC students from all over the country marched in, to the tune of the Armed Forces Medley. They represented 25 states and all branches of the military. Another unexpected bonus: the Sea Aggie Corps of Cadets, celebrating the 50th anniversary of Texas A&M-Galveston. Then the Texas A&M Corps of Cadets marched in. Also Parson’s Mounted Cavalry. And Reveille.Why aren’t the stands full for this? I don’t understand why anyone with a game ticket wouldn’t come early to watch the Corps review. I’m sure the football game will be fine, but I have a feeling the Corps and the band will top my list of favorite things about Aggie football games. Whatever the football players do, it can’t possibly match watching the Corps march in. For my one photo, I chose the end-zone stands. In it I can see all my favorite parts of my first Kyle field game: the Aggie Band, the student body, and the American flags edging the stadium skyline. 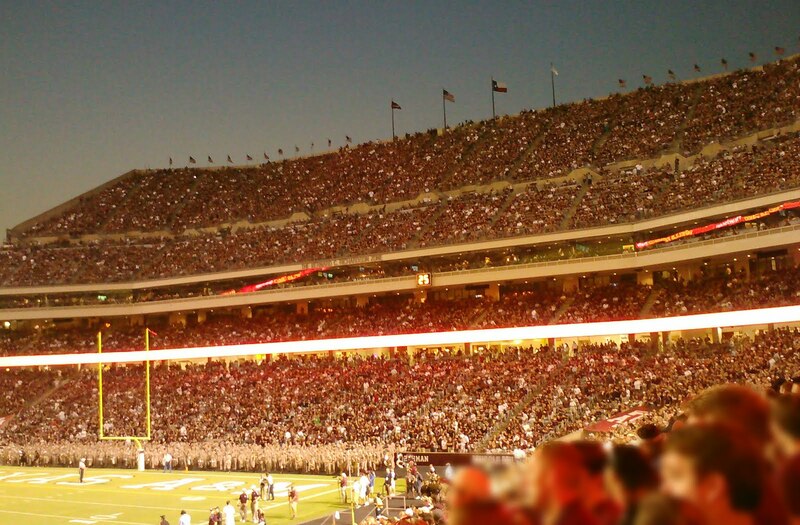 So, why did I wait until December to post my September Kyle Field writeup? The primary reason was that I was not satisfied with it. I knew I had not done justice to the task. Perhaps in another 10 years, if I keep practicing my writing, I might be able to adequately describe the sights, sounds, and atmosphere of a Kyle Field football game. But now, whatever I try just falls flat. So, I gave up. All my attempts at soaring adjectives and action-packed verbs have been deleted, and this is all that remains. If you want to know what a Kyle Field football game is like, you’ll just have to go to one yourself.